Saltine Cracker Salad may sound unusual but is so easy and delicious! 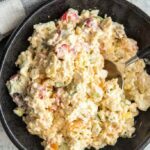 Hard boiled eggs, saltine crackers, tomatoes and mayo form the base of your new favorite side dish! Delicious served alongside leftover steamed shrimp!